1 Does a banana spider look like a banana? Does a banana spider eat bananas? One kind of banana spider does have a banana-shaped body. Its body is also a bright yellow and black color. Another kind of banana spider doesn't eat bananas, but it does hide in banana plants. At times it even becomes a stowaway on bananas being shipped to other places! 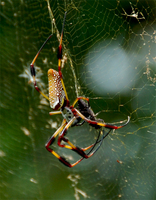 2 Banana spider is the common name for two very different spiders. One kind is the Brazilian wandering spider. It lives in South America and Central America. The other kind is the golden silk spider. It lives in North America. It is also called the North American banana spider. 3 The Brazilian wandering spider is big and deadly. Its body length is between one and two inches long. Its leg span is between four and five inches. This spider is poisonous. Its bite can cause a person to die. The wandering spider is aggressive. It will attack people if it feels threatened. People who are bitten need to take an antidote as soon as possible.